Pronorm has a long and distinguished history. The original factory in Vlotho Germany began production in 1945. From small beginnings, the company built a reputation for delicately crafted, high quality furniture that has stood the test of time. Pronorm now stands as one of the most innovative and trusted contemporary kitchen brands operating out of Germany. Pronorm's design concepts combine cutting-edge materials with exclusive furniture arrangements. This helps to separate them from other German manufacturers. With their distinctive four styles, Proline 128, Y-Line, X-Line and Classic-Line, there's something to suit any contemporary kitchen lover. Natural and authentic, contemporary kitchen design for your home. Pronorm is the only choice for those looking for a truly unique German kitchen. The four styles, Proline 128, Y-Line, X-Line and Classic-Line can be used exclusively or combined with amazing results. Pocket doors are becoming increasingly popular with those looking for a minimal look. Pronorm's Proline 128 range offers you the ability to safely hide integrated ovens and coffee machines behind beautifully crafted doors. 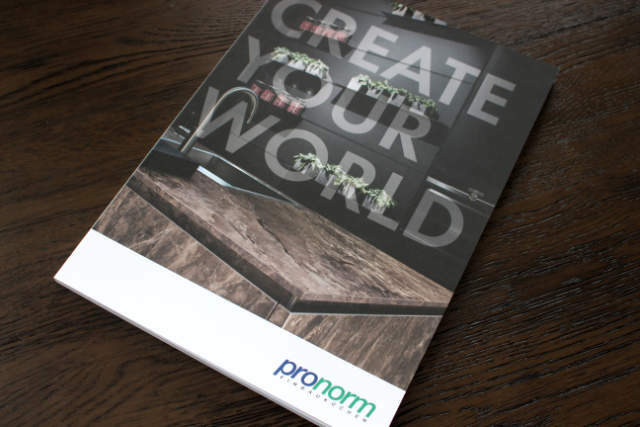 Pronorm offer a huge range of cabinet options in a multitude of colours, materials and surfaces. Their kitchen planning system offers unlimited possibilities. Clearly defined grids on width, height as well and depth allow for truly bespoke designs. Clearly defined grids on width, height as well and depth allow for truly bespoke designs. Cabinet widths include 150, 300, 400, 450, 500, 600, 800, 900, 1000, 1200, 1500, and 1800 mm, with additional width adjustable units and front fillers for precise control. Cabinet depths are available without any additional surcharge at 351, 465, 565 and 715 mm. Pronorm kitchens offer a wide range of accessories that can lift your kitchen to a whole new level. From the stunning Pro-Tech drawers to the award winning Planero storage systems and everything in between. The right accessory can make all the difference to the look and functionality of your kitchen. Pronorm give you the choice to add additional features or leave the furniture in standard specification. Regardless of the choice you make, a Pronorm kitchen will exceed your expectations.